Cast brilliant color onto your floors with this attention-grabbing glass cross ornament from J. Devlin Glass Art. Designed with beveled, iridized glass, it draws light from the outside in, shining sparkling color in all directions. 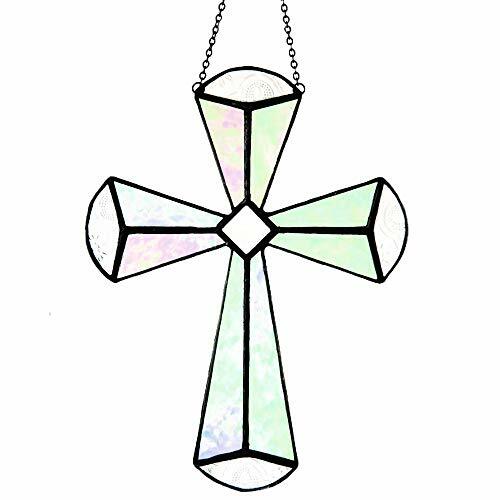 Hung in a window or a glass door, this 6" x 8" cross ornament adds a personal touch to any entryway or room. For yourself or as a gift for a special religious celebration, this hanging cross is sure to make an immediate impression on all who see it. Shop all other religious-themed glass gifts, including other glass ornaments, charm boxes, and photo frames. This J. Devlin Glass Art cross glass ornament is lead-free. Designed and Manufactured by J Devlin 6" x 1/8" x 8"